I'd forgotten just how strong that chip van smell is when running on veg oil... talk about pungent. Still, cold starts at 2:1 diesel:SVO seen more than fine, so I'll try adding a little more, and see how it goes. I've been thinking about ways of doing twin tanks, and I'm wondering about putting a military battery box in place of the middle seat... then I can take the battery out of the passenger seat toolbox, remove the toolbox, and fit another tank. When I eventually add a rear tank, that means a total fuel load of 36 gallons, or 900 miles... I can see fueling up becoming a monthly occurrence. Last time I played with Straight Veg Oil the supermarket price rose to the point that it became un-economic. Coupled with my desire to run on oil that's really free, and not just cheap, I went for waste mineral oil instead. Although I got the engine to run fairly well on old engine oil, the design needed further enhancements, mostly to the fuel pumping and heat exchanging stages. Unfortunately, these never got done as I've been very busy, and they haven't exactly been given top priority. Bolt on tat, and why its all pointless. Bolt on tat is funny stuff. Now, I have never fitted any such Bling to Bitsa, partly because it looks gay, and mostly cos I'm really tight. But, prompted by a post over on the Series 2 Club forum, I fell to museing about what good all this gadgetry might have done me. Those who know Bitsa well may be aware that she has a few dents (actually, make that a lot). I don't think there is a straight panel on there to be honest, and I can't say the fact bothers me much. Even worse is the state of the chassis - it has dents in the main rails, damage to gearbox cross-member, a simply huge dent in the bellhousing crossmember, another ding in the centre of the rear cross-member. The dents are not all new and novel, but are the product of a load of greenlaning, with the odd bit of use round farms and playdays thrown in. The funny thing is, that all this not withstanding, I've yet to damage a single thing there is a guard commercially available for. If I've never bent a steering rod, never dented a diff, nor punched a hole in my sump, what exactly am I doing wrong? I'll go in for almost any loony driving, bar mud runs (only because I can't be bothered cleaning up afterwards, and because I don't like wet feet), but I still keep failing to break the "approved" of items to break. This prompts me to suspect that bolt on tat is, well just that - tat, and it is sold to enrich the seller, rather than for any practical purpose. Still doesn't stop people who only do road mileage buying this sort of tat, and bolting it to their motor's mind you. Oh well I suppose, after all, news has come in that the Pope's apparently a Catholic. Yours truly has been doing some thinking about gear ratios for Bitsa in the longer term. Currently, Bitsa has 4.7 diffs, no overdrive, a normal transfer-box, a series main gearbox, and a 200di engine which gives an estimated 85bhp. The gearing feels decidedly short, with 2nd being suitable for pulling away most of the time, but 70mph (fairly easily achievable) pushing the engine onto the red line for continuous running. Thanks to a rather handy site at http://www.solemnwarning.net/transmission/, I've runs a selection of gearing scenarios, to try and think about what will be a good idea in the longer term. First off, here is a graph showing the ratios in the various gears as she is currently setup. Now, the one thing which I'm determined to do which will affect the gearing is swapping to 9.00 tyres, when I rebuild onto a new chassis with extended spring outriggers. There are lots of reasons for this, and not just that 9.00's are cool - I want more ground clearance when out laning for instance. This doesn't look loads better, but it does get 70mph the right side of the red line, at 3733Rpm rather than 4095Rpm. Granted that's not going to revolutionise anything, but its a step in the right direction. Next question is - what about 3.5 diffs? This puts a 70mph cruse as having the engine at just 2168Rpm. It might hack that, but I'm not sure if it will do the gearbox or overdrive any favours having to deal with an engine constantly developing near peak torque in order to maintain speed. With the engine at 2829Rpm at 70mph, this is lower geared than 3.54 diffs, but it does still have large gaps between the gears, which an overdrive would have helped with. A final option I considered was an LT77 mated to a series transferbox. I'm not really very keen (after all, the Series gearbox is responsible for a good deal of the series driving experience, and its also a lot of work to fit an LT77). Frankly, this isn't high enough geared, with 70mph in 5th at 3104Rpm, when it really needs to be below the 3000rpm mark. It is however really a bit too high to seriously consider in tandem with 3.54 diffs, and I don't think it is possible to include an overdrive in the package either. Another pile of fixing done. I spent a few hours this afternoon sorting out the latest "new" exhaust for Bitsa, to replace the one I wrecked descending Chapelgate. This one uses large bore stainless pipe, and a flat silencer unit rather than a standard Landrover rear box. I don't know if it will do anything for performance in the short term, but longer term, the pipe is big enough bore to convert for use with the turbocharger. I've also fitted a new dipstick from a 2.25D, rather than a 200tdi, which is handy, as the 200tdi dipstick was bent beyond use. Having done some calibrating, I've been able to check the engine oil level for the first time in ages... and concluded it is rather over-full. That probably accounts for the haze of blue smoke that she has recently developed at idle then. Just updated the MPG counter, and it seems I've now broken the 5000 mile mark with the rebuilt Tdi. A quick check of the figures suggests that represents driving 42 miles a day since it went back in, which equates to just over 15,000 miles a year. Well, maybe not, I mean, you don't just drive off down Chapelgate one evening in an average car do you? (I only need to change one wrecked outrigger and make a new exhaust now). I'm having a bit of a revamp of my web pages, this blog is hosted by blogger, but all the images, the mpg calculator and a few other bits of other stuff have been fliting between free webhosts for a while now. I've finally had enough of free webhosts (they all promise the moon, then either don't work, or work really well for a month, then announce they are canceling free packages), so I've actually bought some webspace that should work properly. 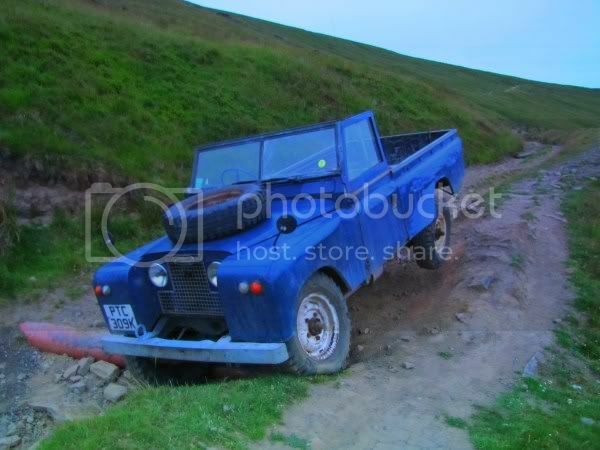 Seeing as that is that case, I'm hoping to put up some decent content on the main SeriesLandrover.co.uk pages, to make it a bit of a FAQ guide for Landrover problems. Amongst the things I'd like to cover are Landrovers and veg oil, 109" brakes, tdi conversions info, salisbury diff rebuild photos (when I eventually get it done). Just organising the last stages of a tour round most of west Yorkshire tomorrow. Main mission is moving a 109" roof from Wakefield to Pontefact, but I seem to have ended up also shifting some 109" axles from Macclesfield to Doncaster, some inner tubes Doncaster to Holmfirth, and some wheels and tyres Maccelsfield to Holmfirth. Still should be a good laugh, and as its all for other folks, I get the diesel bill paid. In other news, apparently Britpart have finally refunded me for the dud springs I returned a year ago. Its a good job the replacements were free, its taken them long enough. I drove past their depot a few weeks ago, and had it being during the day I'd have been tempted to call in and see what they had to say for themselves, but at 9pm on a Sunday night, I didn't think any of them would be in. Got offered a Hicap tub this for Bitsa a few weeks ago, and said no, too expensive. It didn't sell elsewhere, and so I was offered it for a better price this morning, and couldn't resist. Bitsa's current rear tub is knackered, I've been meaning to replace it for ages, and I've always wanted a IIA hi-cap, so this is the perfect opportunity. I'm collecting it from Lincolnshire, current plan is to drive Bitsa down with no tub, and fit it on the spot. I'll have to take a grinder to the current back tub to make it into a Hi-Cap front bulkhead, the main challenge at the moment seems to be sorting the top capping out so it looks right. Just worked out a spot MPG for the last tank of fuel, it came out at 29mpg for the last 137 miles, so it looks like advancing the timing a bit has had the desired effect. On a different note, Bitsa let me down yesterday for the first time since the rebuilt "new" engine went in - the battery was flat as a pancake, and she refused to start. I suspect that the CB had been draining the battery, despite being switched off, as it had a permanent live feed. I've disconnected it for the short term, longer term plan is to sort it with a key switched live. I hope its the CB, if not it means yet another dead 16ACR (I've lost count how many have gone bang now, but I know its depressing). If I have another one go, I'll try and replace it with a A127 off a disco tdi. 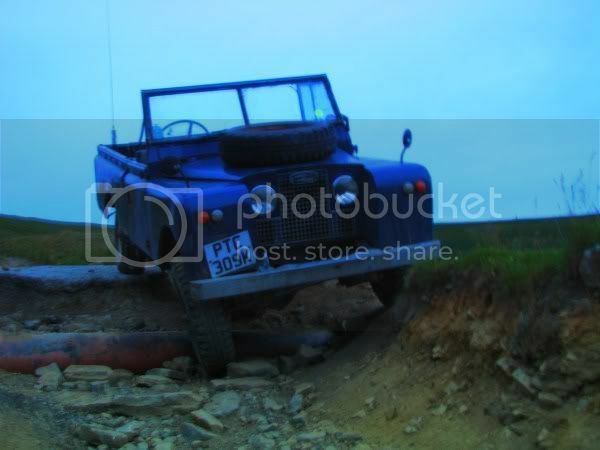 I'm a guy who when is isn't working, spends most of his time and hard earned cash on running ratty old Landies... mad or what.